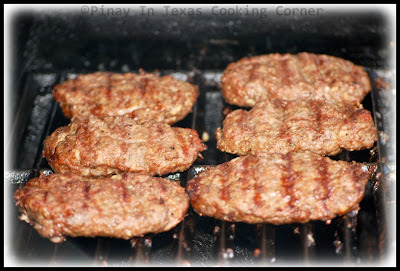 If you are from the Philippines, I'm sure you know where the Filipino Burger Steak originated. 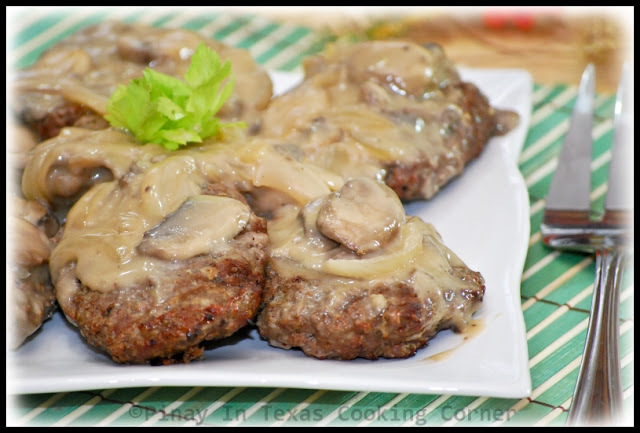 It may look like the more popular Salisbury Steak but it differs in sauce. 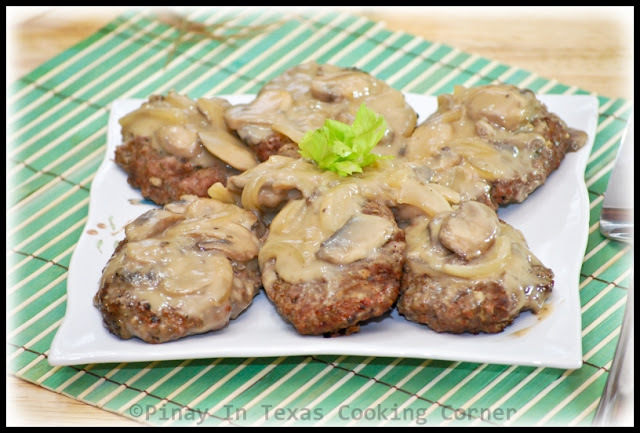 Burger Steak which was made popular to the Filipinos by Jollibee (an American-style fast-food restaurant serving burgers and rice-based meals as well as other Filipino favorites like sweet spaghetti, palabok and hotdog sandwich) in the early 90's is made up of pan-fried beef patties that come with a flavorful brown gravy topped with sliced button mushrooms and served with steamed rice. It became a favorite to most Filipinos not just because of Jollibee's marketing campaign but more because of its affordability and its delicious taste. Jollibee's burger steak first came out when I was in college. I really liked it back then. It's affordable and very filling! But I was on a tight budget and I couldn't be eating out as frequent as I wanted to...so I had to learn how to cook burger steak. Oh well, the truth is I asked my mom to find out how to cook it...and she did come up with her own version. 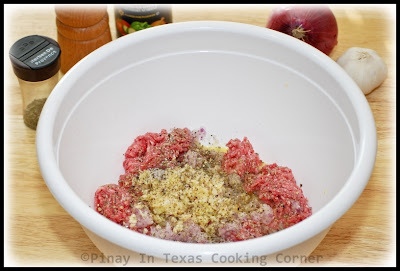 For the burger patties, she combines ground beef, minced garlic and onions, bread crumbs, egg, salt, and pepper; divide it into equal portions; form each into round patty; and pan fry them. Her sauce was made up of butter, all-purpose flour, Knorr beef cube, soy sauce and water. She cooks it in low heat with a can of sliced button mushrooms and then pour it on the pan-fried patties. 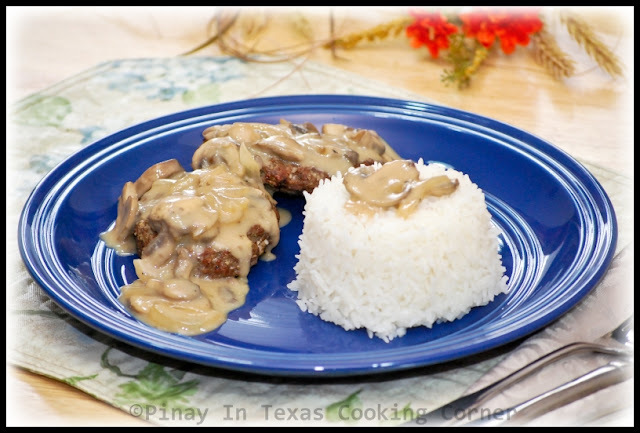 I must say that her version really tasted like the original Jollibee's Burger Steak, and I love it and had been doing the same version for years. 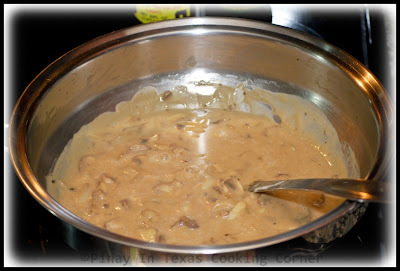 But now that I have 2 girls who loves mushroom sauce so much, I tweaked my mom's recipe and came up with a creamier and tastier version that has become my family's favorite since the first time I cooked it. 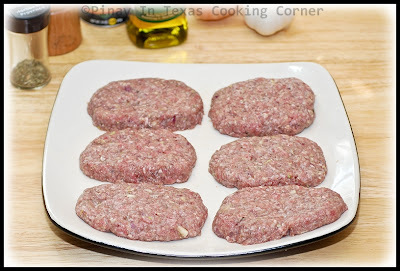 For the burger patties, I eliminated the bread crumbs and added herbes de provence to the mixture, shaped my burger patties into oval instead of round so it will look more like a steak, and grill them for a better flavor. Then instead of my mom's brown gravy, I made mushroom sauce. These are just simple alterations but they sure give a big change to the texture and taste of the dish! 1. In a bowl, combine ground beef, onion, garlic, egg, herbes de provence, salt and pepper. Mix until well blended. Divide into 6 equal portions (about 1/3 cup each) and flatten each into oval shape. 2. Grill or fry (I prefer to grill it) for about 20 minutes or until cooked and both sides are brown. Transfer to a serving dish. Keep warm by wrapping with foil and set aside. 3. 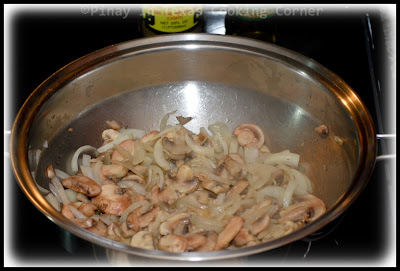 In a saucepan, saute onions and sliced mushrooms until mushrooms are cooked. 4. Add mushroom sauce and milk. Simmer while stirring until well blended. Add soy sauce and Worcestershire sauce. Season with salt and pepper to suit your taste (for me, the saltiness from soy sauce was enough so I just added pepper). Simmer for 3 minutes. 5. Pour the sauce over burger patties and serve with steamed rice. your recipe is amazing..I loveeeeee this combination!! Nicely done, got to try it soon!!! Yum! I was watching a movie where the actors were enjoying a big burger, and then I visit your blog and find this good looking dish, hmmm, maybe it's a sign for me to make some! 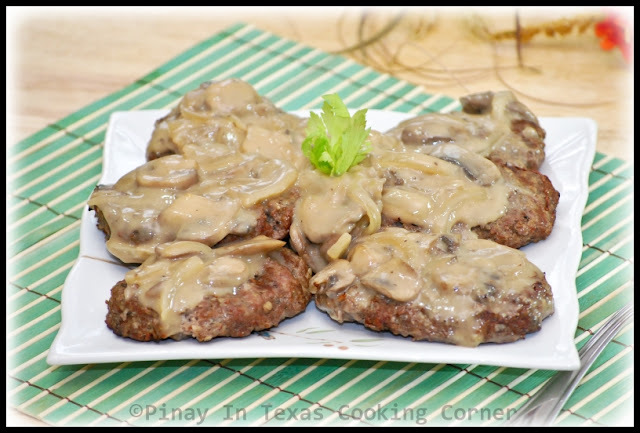 Home made burgers are for sure more healthier and that mushroom sauce is great to go with it though we don't beef but looks tempting. This is a MUST MAKE for my meat eating friends! HUGS! I've only tried Japanese version but this looks just as good. Tina, I've a little surprise for u @ Awards & Architectural Wonders Of Helsinki. Pls drop by to pick it up! Love the addition of herbes de Provence! Sounds great. That looks delicious :) Nicely presented too. I'm drooling!! I need to try this next time i go to Jolibee! Hi! Thanks for the comment! It's people like you who inspire me to keep on doing this! It's such a pleasure to be of help in sharing the goodness of Filipino Cuisine! Herbes de Provence is a combination of marjoram, thyme, rosemary and savory. If you can't find ready made herbes de provence, you can just combine the mentioned spices. Thanks a lot for the recipe! I love the Creamy Mushroom sauce. I'll try this soon ☺ btw which milk is best Fresh milk or evaporated milk? I use fresh milk most of the time.